Shortlisted for the 2015 Queensland Literary Awards Steeele Rudd Award and the 2015 Readings Prize for New Fiction, a Listener Best Book of 2014, and an Australian Book Review Short Story Book of the Year 2014. Arms Race brings together twelve tales from the modern age of escalation. Data theft, internet memes, advertising, terrorism, indigenous sovereignty, drone warfare, opium addiction, syphilis, the moon landing, mining, oil slicks, climate change, giant octopuses: nothing is spared in this collection. Nic Low’s stories go beyond satire, aiming for the dark heart of our obsession with technology, power and image. Set variously in London, a Rajasthani village, remote Mongolia, the West Australian outback and mountainous New Zealand, these are prescient visions of the future and outlandish reimaginings of the past. Arms Race is an arresting debut from a fierce, playful new voice in Australian writing. ‘Outrageous, clever, passionate: a must read. These stories delight on so many levels and are written with a singular energy and skill. 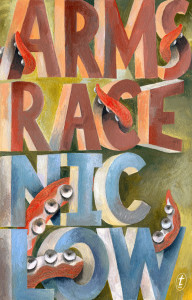 “Arms Race highlights a remarkable depth of voice and narrative range. My favourite from the collection is ʻRushʼ, a humorous and intelligent insight into post-colonial relationships in Australia. Low is from New Zealand. We might want to claim him ahead of Russell Crowe.” – Tony Birch, Australian Book Review, Short Story Books of the Year 2014. 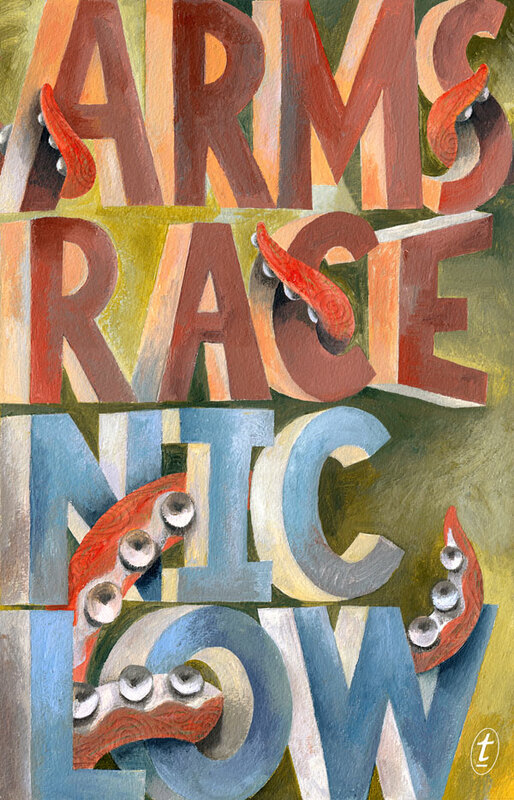 “Nic Lowʼs Arms Race is similarly mischievous, although while Davisʼs stories are claustrophobically focused on the personal, Low targets the political. He provokes his readers with visions of speculative futures that are always about the present. What would it be like if indigenous Australians started a mining operation at the Shrine of Remembrance?” – Maria Takolander, Australian Book Review, Short Story Books of the Year 2014. “Arms Race is wryly amusing, thematically fearless, and has left me hopeful and excited for the future of Australian short fiction.” – Maxine Beneba Clarke, Australian Book Review, Short Story Books of the Year 2014. “… there’s a bony grace to the prose that makes the best of these short stories surprising … especially in opium fever-dream The Lotus Eaters, spare and insightful outback tale Scar, and Photocopy Planet, a canny interrogation of the appeal of self-generated alternative histories, set in rural India but relevant everywhere. Low has a strong environmental conscience and a darkly satirical streak, probing the faultlines between cultures, classes and ideologies with great skill, sending back dispatches as dry as Sahara sand.” – Your Weekend, NZ. Melbourne Writer Nic Low Hasn’t Forgotten His Roots: Nic interviewed on TV3’s Firstline, 26 August 2014. Politics, polemics and satire: interview with Nic on Radio New Zealand National’s Nine to Noon program, 22 August 2014. Arms Race: interview with Nic on RDU 98.5FM’s Morning Glory Show, 28 August 2014. 3CR Podcast: Behind the Words interview about Arms Race (starting from 13:25). 2SER’s Final Draft podcast: Arms Race and Nic Low on Telling Tales.